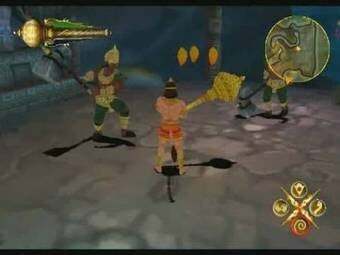 Never mind that Hanuman: Boy Warrior - billed as the first console game developed entirely in India - is a crappy game. It's controversial! Well, to an American Hindu, anyway. I am not a Hindu scholar by any stretch. But a quick check reveals that Hanuman is one of the more important figures in Hinduism and the Ramayana, an Indian epic poem. So, putting him into a video game - worse yet, a video game in which he can be manipulated - was bound to rankle someone as trivializing sacred figures and concepts. [Zed argued that] controlling and manipulating Lord Hanuman with a joystick/ button/keyboard/mouse was denigration. Lord Hanuman was not meant to be reduced to just a "character" in a video game to solidify company/products base in the growing economy of India. Rajan Zed further said that as a PlayStation2 video game, Lord Hanuman would be in the company of America's 10 Most Wanted, Bad Boys, Barbie, Britney's Dance Beat, First Kiss Stories, Guitar Freaks, Jackass, Killer7, Looney Tunes, Mafia, Mercenaries, Midnight Club, Mister Mosquito, Nicktoons, Psychonauts, Scooby Doo, Truckers, etc. Oh no, not - gasp - NICKTOONS!!!! A better response may have been to just kill this thing with silence. GamePolitics points out that the Indian gaming site Tech2 gave Hanuman (the game, not the deity) a terrible review. Similarly, Gaming Indians is circumspect about the controversy.